Measure 1/4 C. gravy from jar, combine with beef, bread crumbs, onion, egg, salt & pepper. Shape into 8x4x1 inch shallow pan. Bake in 350° oven 1 hour. Remove from oven and carefully drain fat. Spread potatoes over top and sides of meat loaf. Drizzle melted butter over potatoes, garnish with paprika. 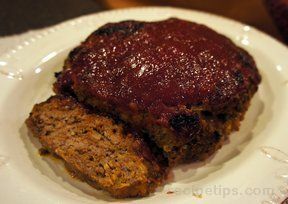 Return meat loaf to oven, bake an additional 20 minutes. Pour remaining gravy over top and bake 10 more minutes.